We are asked about this constantly. The French Paradox offers that alcohol is no bad thing, although there is research showing regular large volumes leads to more cancer. So what is the truth? High alcohol consumption definitely puts the body at risk, the most obvious diseases being cancer and liver related. Certainly people who have impaired livers should be overly cautious of alcohol. And women should note that their consumption should be roughly half that of men, due to body and liver relative volumes. ‘Good alcohol’, if there is such a concept, would seem to start and end with red wine. Red wine is made with the wine fermenting on both the skins and the grape seeds. Grape seeds provide powerful antioxidant properties, and in the VITAL study, grape seed extract beat the nearest anti-oxidant by 42 per cent in its abilities. Red grape skins are known to contain resveratrol, although the more they are sprayed, the less they contain, as it is produced as the grape’s natural protection to fungal attack. Resveratrol has been shown by oncology experts like Professor Gerry Potter, in his work on Salvestrols, to be a pro-drug. Once inside a cancer cell, it is converted by the CYP1B1 gene into picetannol, which promptly kills the cancer cell. Resveratrol is a polyphenol and has been shown to have all manner of properties in research. It improves bone health, reduces type-2 diabetes risk, has positive effects on the brain and lowers cholesterol, macular degeneration and Alzheimer’s risk. Resveratrol also replicates the effects of calorie restriction in the body and stimulates the production of sirtuins, which has been linked to increased longevity. Critics argue that you don’t get much resveratrol from a bottle of red wine, but in the Mediterranean diet the issue is more likely to be long-term build up. One Harvard study commented that people who lived on the North shores of the Mediterranean, consumed on average 4 glasses a day, but in my experience, the glasses are most usually a third of the size of those used in a UK or American bar! Certainly most researchers talk of the importance of consuming ‘modest amounts’ of red wine most days. In www.chriswoollamshealthwatch.com we have covered research showing that red wine reduces ‘bad cholestrol’, LDL, in the body and another study showing that red wine is actually ‘liked’ by beneficial gut bacteria. Their numbers increase and thus the immune system strengthens. A Harvard study in Cell Metabolism in 2012 showed that red wine increased anti-ageing benefits, even in the presence of high fat diets. 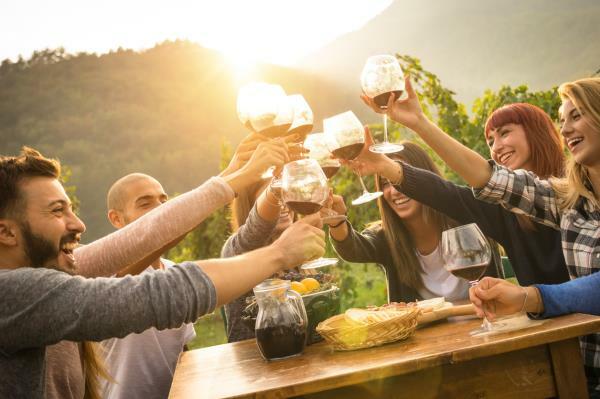 A study in BJM showed regular wine consumption was linked to less depression and greater mental health. Two studies on cancer resulted in a surprising finding. Moderate red wine consumption seems to reduce oestrogen levels and is associated with less colorectal cancer (University of Leicester) and less breast cancer (Cedars- Sinai Medical Centre, LA).